Distance is the theme this week from the folks over at the blog Where’s My Backpack? and I aim to fit that theme. During the same culinary tour where I indulged in multiple shots of pisco, our gracious guide also took us sight-seeing. From Barranco, the artsy district of Lima, we were able to look out across the art galleries, roads, and a section of the Pacific Ocean to see the following landmark in the distance. The location you are looking at is Morro Solar. The cross you are looking at in the distance is made of metal, but that metal has some significance. According to our guide, when Pope John Paul II (who is still popular in Peru) came to visit in the 1980s, there were a series of risers built so that people could sit in the streets and watch the Pope drive by. 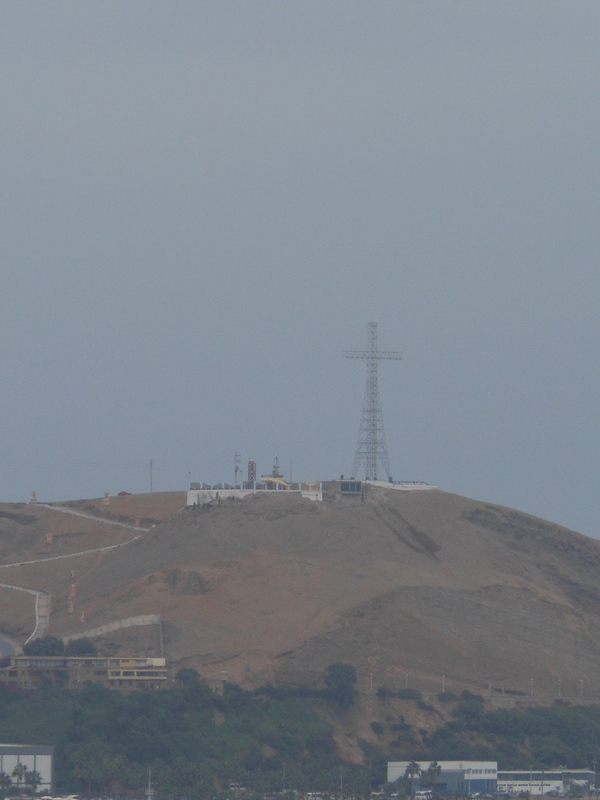 Some of the metal from those risers was recycled and constructed into the cross that now adorns Morro Solar. Oh, and it also lights up at night. Posted on August 31, 2013, in Peru, Photography and tagged Lima, Morro Solar, Peru, photography, travel. Bookmark the permalink. Leave a comment.